So I have been wanting a sweaterdress for ages, but after my bathrobe attack disaster I feared the sweaterknit. This season the sweaterdress is *everywhere* and I really wanted in on the trend. When I went on my thrift store sweater-buying melee this sweater did not fit my 100% wool criterion (it is nylon, angora, and metallic) but I am drawn to all things shiny and soft and I had to have it. When I got it home and tried it on I thought maybe, just maybe, I had found my sweaterdress. I decided it would be perfect for New Year's Eve, casual yet cute, sparkly yet tasteful, so I took scissors to it when I got back in town from visiting family for the holiday. You need a sweater that is many sizes too big for you for this project. I really don't know what my RTW size is, but I'm guesstimating that this sweater was about 6 sizes too large (I'm probably around a RTW 4 and this was an 18/20). 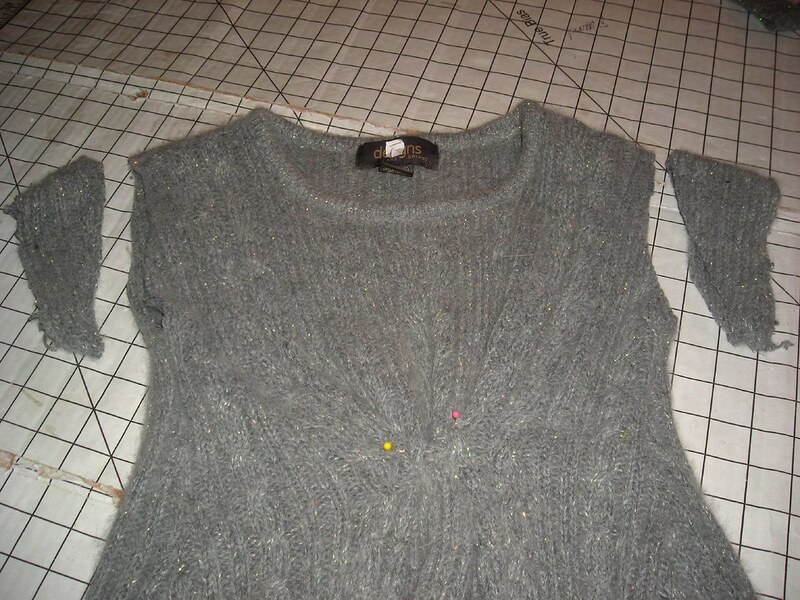 For a sweater that is only a little too big, you can take it in by sewing into the sleeves and side seam as one, but for something that is much too big you have to take off the sleeves. I also cut out the shoulderpads--given the price of shoulderpads that alone paid for the sweater! After you've cut off the sleeves, try it on mark with pins 1) the new bottom of the armscye, and 2) how much to take in the side seams. I considered making this just a body hugging t-shirt dress style, but I am just too self-conscious of my belly so I didn't tighten it all the way at the side seams, leaving room for the center pleats I would add later. Once you have sewn the new side seams, put it back on and mark the shoulder edge. Trim away the excess. 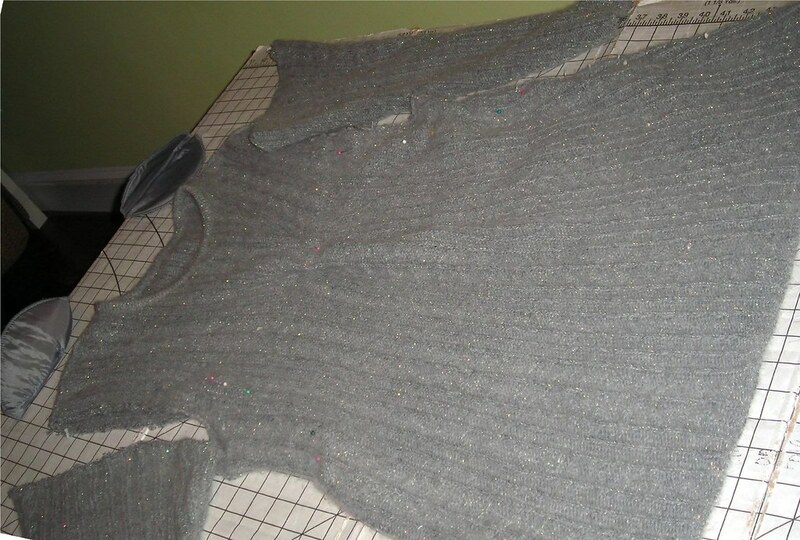 This sweater had been constructed with twill tape to stabilize the shoulders. If yours isn't, you might want to add some shoulder stabilization here. I should also note that as soon as I made any cuts I immediately took it to the serger and finished the edges to prevent unravelling and too much stretching. At the same time you're trying on to mark the shoulders (and if you want a short sleeved dress, the oversized shoulders turn into a cute cap sleeve), pin out your center pleats. I did three inverted pleats at center front right under the bust for an empire look. I sewed them down about two inches long on the inside. Now it's time to get back to the sleeves. You're going to turn them upside down so that the larger armscye becomes the lower hem of the bell sleeve. I sewed the elastic casing by hand because the ease situation would have been a pain on the sewing machine. 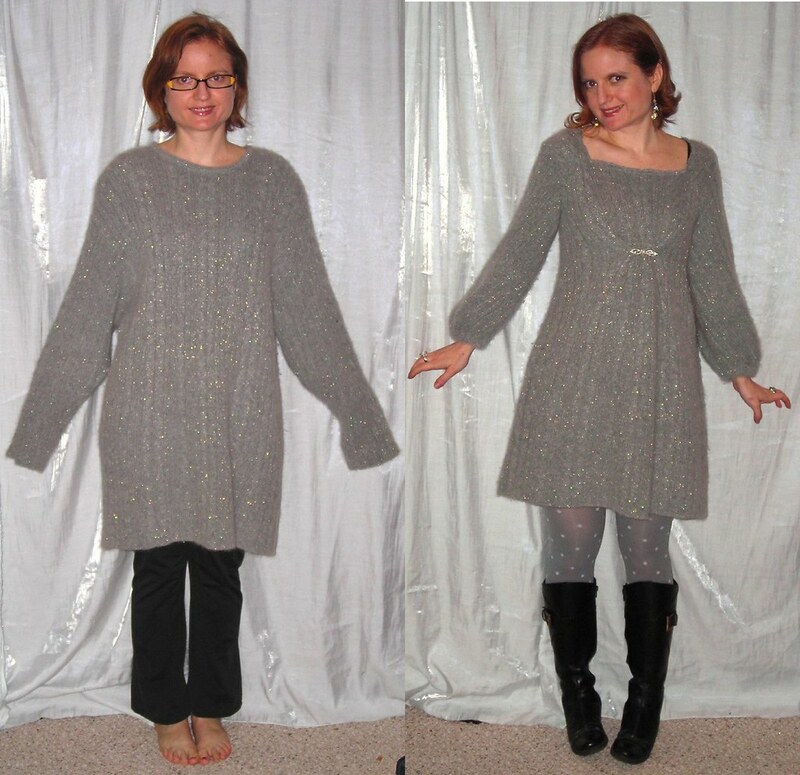 When I first tried on the sweater I was sure I'd have to shorten the sleeves, but in fact once I had fitted the sweater and shortened the shoulder they were only just barely long enough. Cut the wrist edge into the rough shape of an armscye. I didn't worry about being too precise here because the sweaterknit stretches and I knew I could ease the sleeve into the armhole. I did pull the sleeve onto my arm up to the shoulder to make sure that it was about the right size. 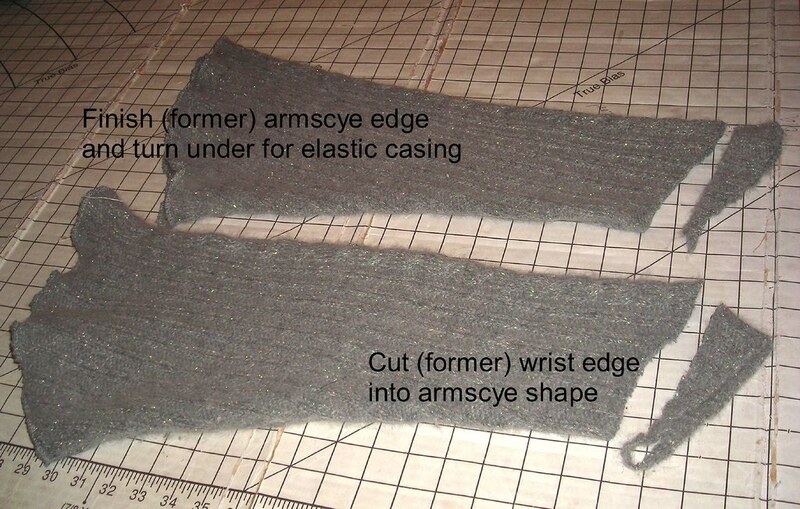 My sleeve was tapered at the wrist; if yours is not you might need to take it in a little to fit in the armscye. Set in your sleeves and thread elastic through the lower casings; you'll need a longer piece of elastic than you think because the sweaterknit adds a lot of bulk to the casing. I could have stopped there, but I am just not a fan of the crew neck. This is not for the faint of heart because you're going to have a wiiiiiide neckline once you cut off the original finished neck edge, there is no way around it. First I cut off the collar as narrowly as possible and immediately rushed to the serger to finish the edge. Then I stabilized the edge by twin-needling over clear elastic, stretching the elastic slightly to take up as much of the neckline as I could. 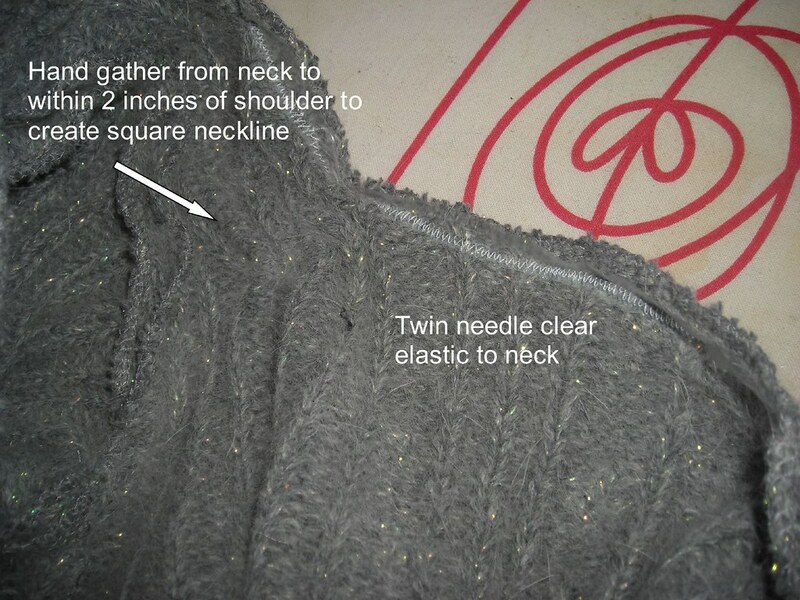 Then I squared off the neckline by hand-gathering at a diagonal from the neckline toward the shoulder. And voila! This isn't a super-quick project; it probably took me about four hours all told. So allow enough time for yourself. I put a decorative pin over the center pleats to emphasize the empire shape; it's not functional. I am so happy finally to have a sweaterdress! Especially for under $5!!! I love it!! It seems I need to take a thrift store jaunt into DC very soon. ADORABLE. Would you have done all this pre-serger? This is way cool. You are rockin' the sweaterdress. LOVE IT! and you have inspired me. My weekend is going to be full thrift store shopping. Wow! You did a fantastic job! It looks adorable on you! Looks fantastic. When knitters cut fabric they first stitch close to where they want to cut with a zigzag stitch to secure that the fabric doesn't unravel. This might make it less stressful when cutting into your sweaters. This very well may be the most adorable thing *ever*. That is super cute PLUS you can feel all virtuous because it is Recycled. 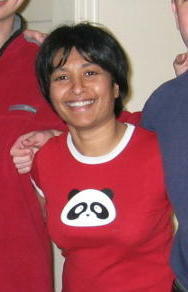 What a great refashion and you look superb in it! Brava! You've done some amazing refashions!!! so cute! The new neckline looks so good on you! Very cute! Your creative-ness with an oversized sweater is amazing. I hope you are entering the refashioning contest over on PR. What a great transformation! From ugly to fantastic! Love it - I would never think about remaking a sweater as you did - a great inspiration. Unbelievable! HOW did you see that great dress hiding in that huge sweater?? You are fearless! Bravo! Creative, comfortable, and fashionable. You did a fantastic job with that sweater, and you look wonderful wearing it. MARVELOUS! What a wonderful transition. Thanks for your comment about my coat and I agree with you "SEWING IS A BLAST"! What a great transformation! It even makes YOU sparkle! This is recycling at its best. You did a great job. The dress looks really good on you. How creative and cute. Great job. Great job! Looks really cute. That is soooooo cute!!! 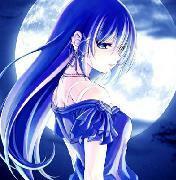 I love that dress!!!!!!!!!! Wow, this dress is super cute. What an elegant way of recycling old clothes! Great and very, very cute! Absolutely adorable. You did a fantastic job on this! Very, very cute. How tall are you? That looks like one HUGE sweater in the before photo. I love what you did with it. i want one too! Very cool, and the pleats are very flattering on you. I love it! The end result was well worth the time spent!! Trena, your stuff is so cute I had to tag you with a blog award (which you've probably gotten a million times before). See my 1/6 post... and I too love the sweater dress! wow that came out SUPER cute! I love the sparkly! That looks great! 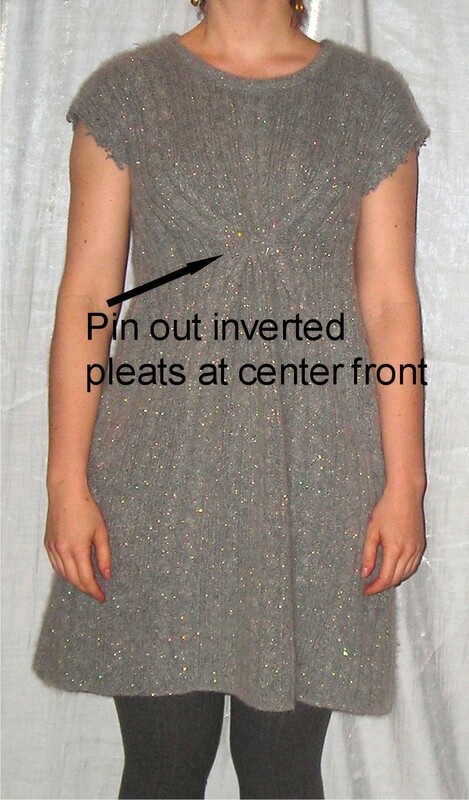 I love the neckline and the inverted pleat. So adorable! Very cute! What a great transformation. The sweater dress is a fav for me too and this one looks gorgeous on you! That is the most adorable dress ever! I don't know what you do in your everyday life, but I think you should seriously consider a career in design. Creating a wonderful dress from that frumpy sweater was pure genius. I love the sparkly tights, too. Quelle belle réussite! That is really neat. I love the refabrication. Love it. That is cute! I bet people are asking you where you found the FABRIC!